Like many people, I tend to read a selection of reviews before deciding whether to buy a product or a book. Also, like many people, I actually write reviews infrequently, and I write fewer now than I used to. Partly this is because my partner once told me off when I was thinking of posting a less than glowing review of a book by a well-known author even though I 'd given up on it at about half way! Perhaps another reason I don't write so many reviews is that I now know what it's like to be on the receiving end! Either way I do know they are very helpful for an author and for the purchaser. 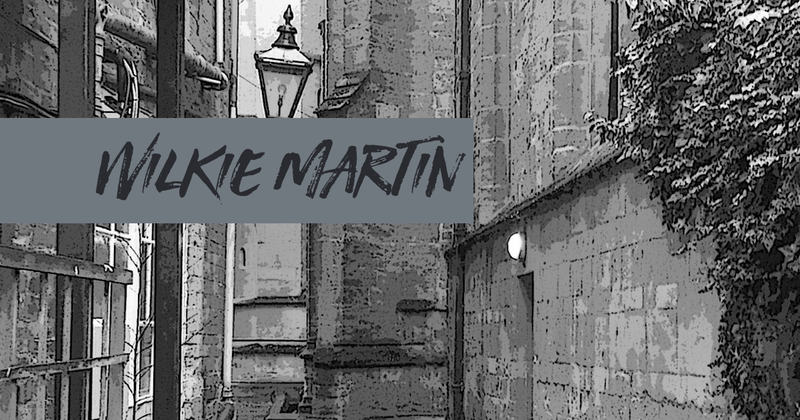 Do reviews matter? And what does it mean to the author? What can I say in a review? How long does a review have to be? Where do you write reviews? How will my name be shown on my review? 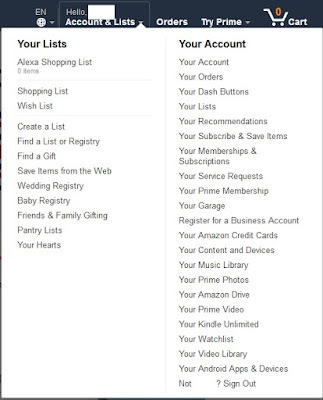 What does 'Amazon Customer' or 'Kindle Customer' mean? What does 'VINE VOICE', 'TOP 50 REVIEWER', 'TOP 100 REVIEWER' 'TOP 500 REVIEWER', 'TOP 1000 REVIEWER' mean? As I read and depend upon the published reviews of others when I make my decisions to buy, I think they matter. Having them makes it more likely that people will take a chance on an author when they come across their books for the first time. Once a few reviews are available, a book gains (or not!) 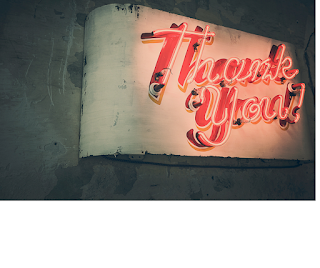 some of the social proof that is important in today's online world. An online review is the equivalent of a personal recommendation from a friend. Reviews are also often a prerequisite when setting up book promotions since many of the best promotion websites and newsletters require a minimum number and a minimum average value on a book before accepting them for a promotion. The promotion sites also use reviews as they only want to recommend readable books to their subscribers. Say something about the book? Was it good quality? Did it meet your expectations? Did you like it? Would you read something by this author again? Would you recommend it to a friend? What made you get it in the first place? Was it a gift? And did you enjoy it? Was there a character in the book you particularly liked? Have a look at what the other reviews say - if you agree with them then you can write the same or something similar. Or if you disagree with a particular review say the opposite. They don't have to say much at all. Anything from 4-5 words to 100's of words if you feel so inclined. Unless buying direct from the publisher, it isn't helpful to others to say that a book was delivered quickly or not as this doesn't say anything about the book itself. Try not to make the review just a plug for a book by another author as this affects the reputation of the author you mention and doesn't help them. This type of review even has a name - 'sock-puppetry'. Remember that the description or price of the book, or the details in other reviews, can change, so if you refer to them include the parts you agree or disagree with. And remember that authors have human feelings! Most online retailers allow you to add reviews to listed books. And online library services such as Goodreads also have review options. Write a review in the same place as you buy or list the book. Find the book you want to review and then click on the option to write one. This is for adding a review on Amazon, although other places will be very similar. 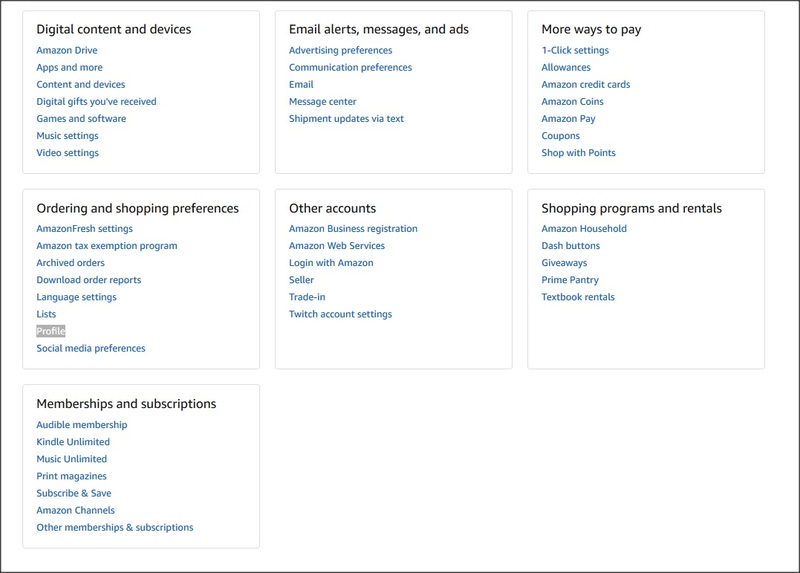 First logon on to Amazon. 1. Find the book you want to review. 2. Scroll down to the bottom of any current reviews . 3. Click on the button 'Write a customer review'. 4. Find the book you want to review. 5. Click on the '## customer reviews' next to the star rating to the right of the book. 6. Click on the button 'Write a customer review'. 1. Tick the star rating you want to give a book. A star rating of 3-5 is a positive review, and a rating of 1 or 2 stars is a negative review. 2. When you've ticked one a box will appear under them. This is where you enter your review. 3. When you start entering some text in the first box, a second box will appear. This is for the 'heading' and is the text that appears in bold at the top of the review. Select a few of the best descriptive words from your review and copy them into the heading. Or you can just say give your number of stars in text ' 5 stars', '3 stars', '1 star' etc. 4. Select 'Submit'. You've now added your review. Yes you can edit your reviews. They are linked to your Amazon account and available under 'Your Account'. 1. To get to them go to the top option 'Your Account' on the right the drop-down list under your 'account & lists' (under 'Hello'). 2. Click on 'Your Account'. 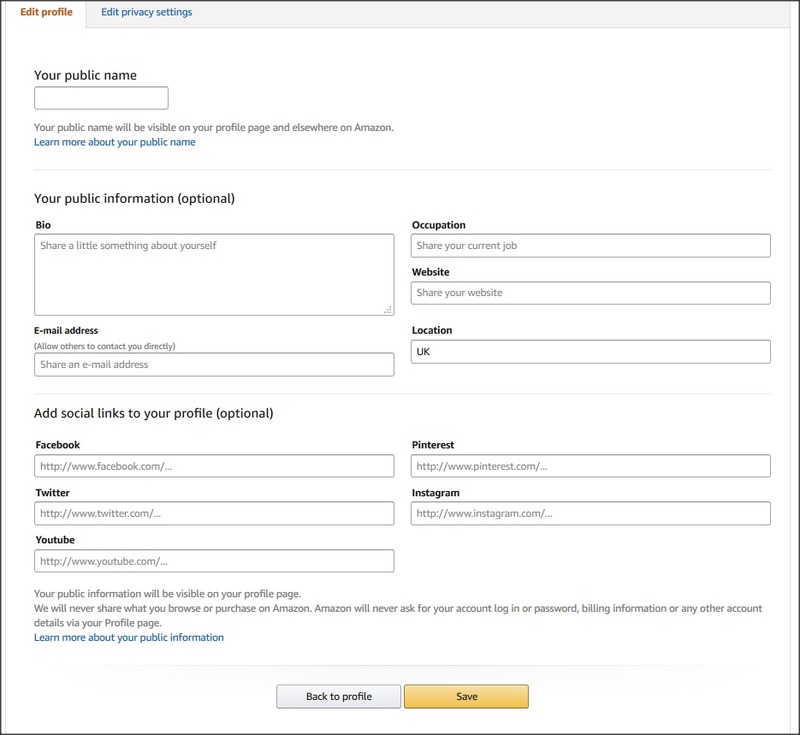 Then in the account options select 'Profile' from 'Ordering and shopping preferences'. Your existing reviews are listed when you option your profile. 5. Scroll though to find the review you want to change. 6. Then just under the review you find the option to 'Edit review' or 'Delete review'. Either Edit then Submit your review (as above) or Delete it. Sometimes a review has 'Verified Purchase' next to it and sometimes it doesn't. 'Verified purchase' means that the reviewer brought this book using the same account as the review is written with. If the 'Verified Purchase' is not next to the review then they either brought it with a different account, had it as a gift or received a free review copy. If it is a free review copy then the review will often say so. 'Verified Purchase' will be added automatically if you brought the book using the same account. You can choose the name you want used as the 'By' information next to all your reviews by setting up the name in your profile. 1. To get to your profile go to top option 'Your Account' on the right the drop-down list under your 'Account & Lists' (under 'Hello'). 2. Click on 'Your Account'. 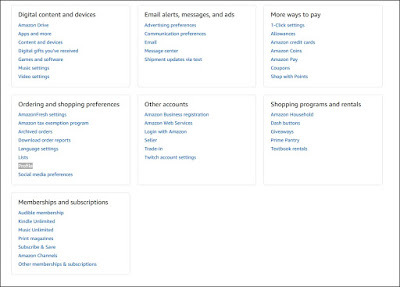 Then in the account options select 'Profile' from 'Ordering and shopping preferences'. 5. 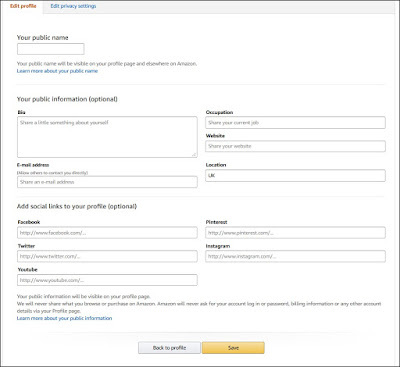 When on 'Your Account' 'Profile', select 'Edit your profile'. 6. Edit 'Your public name', this is what is shown as 'By' next to your review. Set this to anything you like - use a pseudonym if you wish. 7. You can also enter biographical and other information which will be shown to anyone who clicks on your name next to your review. If you want people to contact you to ask you to review their books or other products, then enter your contact details and give some information about the sort of things you would be interested in reviewing in the 'Bio'. This means the reviewer doesn't want to show their name or has not setup their profile information. 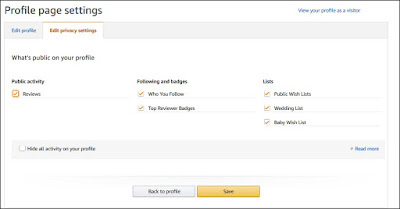 When you write a review on Amazon you will receive an Amazon reviewer ranking. When you write more and more reviews or when your reviews get a 'like' then you move up the rankings. 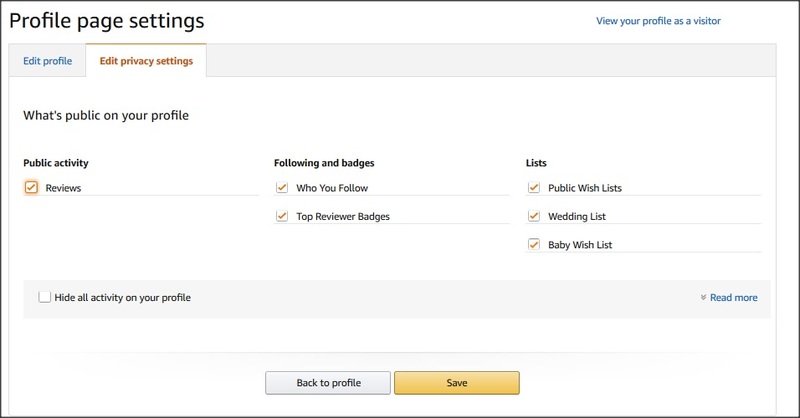 If you write a lot of reviews and get into the top 1000 or above then you are awarded a reviewer badge automatically. Provided you haven't un-ticked the option to show 'Top Reviewer Badges' then the badge will appear automatically next to your name. A 'Vine Voice' is someone in Amazon's Vine programme, where they receive free products and as a part of this programme have to write a review for those they receive. I hope the above is helpful and encourages you to write your first review. Thank you if you are a reviewer, or if you are now going to write your first review. Reviews really do make a difference.